There are a lot of weather apps out there, but being British, that’s fine by me – discussions about it are pretty much a national pastime. However, when I heard about YoWindow’s app to show you what the weather is like exactly where you are, I had to wonder what the point was. Can’t you just open a curtain and check? Does the drip of water running down your phone screen as you check your notifications not give a big enough hints as to current climate conditions? So if it’s raining outside, it’s raining in YoWindow – not a little crappy cloud symbol with some water drops, it’s raining across the whole screen. It’ll also reflect an accurate sunrise and sunset time for wherever you are in the world too. Most people, however, probably want to know the weather in the near future, rather than right outside the window now. 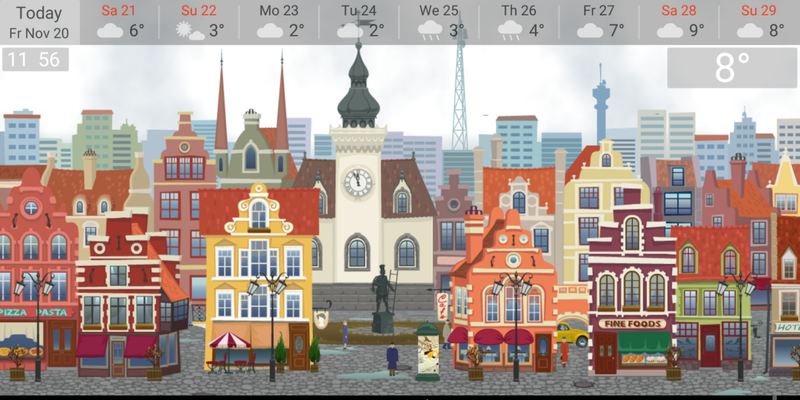 For this, you can just scroll your way through a timeline to see the predicted weather for your location animated with a parallax effect on screen. Tapping the Live button jumps you back to the current time of day. You can also see a more traditional looking forecast by tapping the screen to hide or show details, but where’s the fun in that? Swapping out the background image for a different scene (town, village, seaside, airport, etc.) is also simple enough and each one has its own set of slightly different sounds too. Naturally, you can check out the weather in other locations too in just a few taps. If you want to avoid needing to open the app at all, you can set it as your background or ‘daydream’ option too. Getting in the way of all this on the free version are ads. To remove them will cost $2.99. YoWindow is available on Android and iOS.